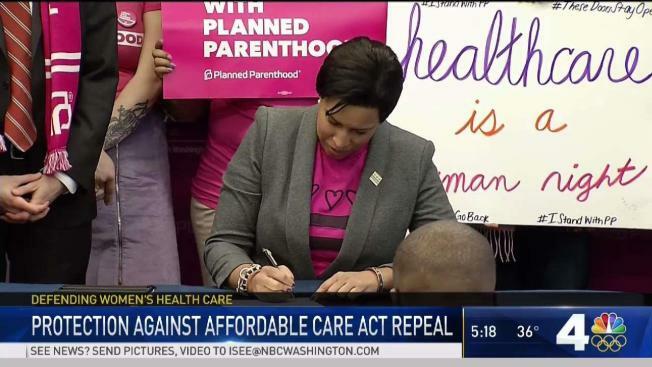 Mayor Muriel Bowser signed the law at the Planned Parenthood location in Northeast D.C.
A new D.C. law will allow pharmacists to prescribe birth control. Women who want contraception would take a self-assessment of their health, then a pharmacist could give a 12-month supply of birth control. Eight other states have similar laws, but the rules and regulations vary widely. A bill that will give women access to birth control prescriptions at pharmacies was signed into law by D.C. Mayor Muriel Bowser on Wednesday, meaning that within a year, many women could get contraception without a doctor's visit. "We trust women to make their own decisions," Bowser said ahead of signing the bill. D.C. would be the eighth state to support such a law, NBC Washington reported in December. Insurers will also be required to pay for contraceptives. Under the law, pharmacists could start prescribing up to a 12-month supply of contraceptives to eligible patients as early as October. Women would be required to use a self-screening tool developed by the D.C. Board of Pharmacy to identify risk factors, including high blood pressure, liver tumors, heavy smoking or heart disease so pharmacists can determine if it's safe to prescribe. Patients who face serious risks from contraception will be referred to their primary care doctor or a nearby clinic. Not every pharmacist would be automatically eligible to prescribe, but every local pharmacy will be required to publicize in stores and online when women could come see a pharmacist licensed to prescribe contraception. Bowser signed the law, which covers a range of women's health issues, at Planned Parenthood of Metropolitan Washington's headquarters in Northeast D.C.
"Regardless of what happens at the federal level, health insurance really has to mean something," the mayor said. "No woman should ever have to decide between paying rent and going to simple check ups." Regulations on pharmacist-prescribed or over-the-counter contraception vary widely in the eight states that have similar laws. For example, many California pharmacies choose not to offer contraception without a prescription, despite state laws that allow pharmacists to prescribe them, the Los Angeles Times reported. Increasing birth control access is only one rule in the broad Defending Access to Women's Health Care Services Amendment Act, which the D.C. Council unanimously passed in January. Insurance companies will be required by D.C. to pay for a number of preventative health services, including breast cancer, diabetes and HIV screenings; well-woman exams; counseling for domestic violence survivors and breastfeeding support. Insured residents can access those services without paying anything out of pocket. The local chapter of the American College of Obstetricians and Gynecologists told News4 the legislation should go further and make birth control available over the counter, like ibuprofen is. However, they voiced support of the bill as a whole. "This bill is much bigger than that single provision. We support the broader legislation because, in the face of the administration's attempts to undermine coverage, the D.C. City Council can and must be a backstop. With its passage, we will send a message to the administration: women's health is medical, not political," the organization's vice chair, Sara Imershein said in a statement. As with every D.C. law, Congress has a chance to review the legislation within 30 days. “No other state or local jurisdiction in the country has to worry that a random congressman is going to try and meddle with a locally passed law,” Council member Charles Allen, who authored the bill, said in a statement.